no time at all…even if you have never made a card before. - Bev Leeson, Victoria, Australia. If you have ever wanted to create jaw-dropping, eye-popping handmade cards at the drop of a hat (amazing your friends and family with your talent and making them feel cherished by your personalised gift from the heart)…while having fun and expressing your personality… then this will be the most important message you ever read. Here’s Why . . . I started making cards in 2004. It seemed like a natural progression from scrapbooking, but it wasn’t as easy as I thought it would be. I was a complete novice and was always struggling to find ideas and inspiration. One day my mind would be overflowing with ideas and I’d be itching to get to my craft table to make cards. And the next would have me staring blankly at all my supplies wondering what on earth to do. Those days were terrible – sitting there desperately wanting to make something beautiful but lacking that creative spark to get me going. It was heart-wrenching. I would sit there for hours and hours and have absolutely nothing to show for my efforts, except maybe a pile of supplies messily dumped all over my desk. I would agonise over my designs. I’d keep shuffling things around, trying different arrangements, taking things away, adding extra things in – all in an attempt to make things just right and create that ‘wow’ factor. I was even afraid to cut up my papers in case I made a mistake and ruined them! Doesn’t that drive you bananas? There’s nothing worse than sitting down to make someone a birthday card only to find you have no clue what to do – especially when the birthday party is just an hour away! Designs With Ease…Whenever I Want! And when I did, my card making world changed forever. After just a few short days of trying these new secrets. . . I couldn’t wait to sit down and make cards…as it no longer felt like a chore. It was so easy! And you should see the looks on my loved ones faces now when they open up a card from me! Their eyes just light up and a huge smile crosses their face. I even get exclamations of “Wow” and “That’s so cool!” from my teenage nieces and nephews. My handmade cards have become treasured keepsakes that stay on display for months (sometimes years) after the special event that they were created for has passed. Begging Me to Show Them “How I Did It”! And it just keeps getting better and better! My fellow card makers think I am a card maker extraordinaire with special creative powers. But the truth is, it’s not magic at all! What I discovered had nothing to do with my ability to be creative…and the secret is so simple. All you need is a plan! Plans are essential in our every day lives. Last time you took a family vacation, you had a plan. You knew where you were going, how you were going to get there and what you were going to take. Sure, you probably made a few minor adjustments along the way – perhaps you took a side trip, made an additional stop or skipped something altogether, but you still had an overall plan. And by having that plan, you didn’t have to constantly stress about all the little decisions along the way, so you had more time to relax and enjoy yourself. Card making is no different. When you start making a card with a plan, you don’t have to worry about all the tiny little decisions that we often get caught up in. You already know what your overall design will look like (i.e. you know where you are going), the steps you need to take to get there and what supplies you need. So you can focus on having fun. Having a plan means you have a very specific and clear direction to follow, so you don’t have to sit there staring aimlessly at a blank card for ages. And believe me, I know what that feels like. I used to think I didn’t have any creative flair at all. I would look around at all the fabulous creations other card makers were making and I just thought that type of creative genius was way out of my reach. This Was A Huge Advantage Over Other Card Makers! I could be a “card making guru” without being the next Picasso! I found my confidence and was no longer a slave to the creativity “monster.” I could create distinctive and enchanting homemade cards whenever I felt like it without any of the frustrations of trying to find inspiration. It’s like having the light bulb to your imagination permanently switched on. So what’s the big secret? I’ll tell you! Card Making Sketches are the secret to my card making success. This overlooked and often forgotten technique sent the originality and ‘wow’ factor of my handmade card ideas through the roof by allowing me to focus on the fun side of card making (like colours to use, techniques to try and embellishments to play with) and not the dull, difficult stuff like trying to figure out how to arrange everything in an eye-pleasing design. Sketches are so easy to use! They allow you to start every new card with a plan so you know what you are doing before you start. 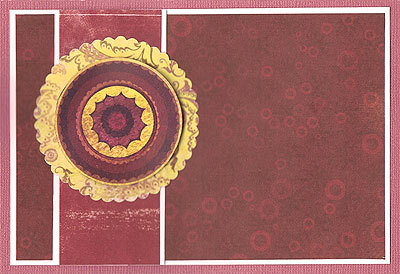 They show you what elements you will need to make your card and how to arrange them so that they look fabulous. Anyone – anyone – can use sketches to instantly transform dull, blank cards into first-class masterpieces exploding with colour, gorgeous patterns, exquisite embellishments and anything else your imagination can dream of. Whatever your level of experience, you’ll have your loved ones and fellow card makers drooling over your latest creations in envy. How can this simple secret do all of this for you? Easy. . . because this secret. . .
YOU Sit Down to Make Cards! I have been creating card sketches for many years now, but I have only ever made a handful of them publicly available… until now! 20 Sketches for Vertical Rectangular Cards. Here’s how a sketch works: A sketch is like a map that allows you to “test drive” your design before you start pulling out all your supplies, cutting up papers, playing around with embellishments and sticking things together. With a quick glance, you can see exactly what your card is going to look like, the different elements you need to make it and how to arrange them so that they look incredible. A circle that is centred towards the top of the vertical strip and serves as the focal point. As you more than likely already know, the biggest time wasters for us card makers is indecision and procrastination. Both usually come from a fear of failure and not wanting to make a mistake. We put so much of ourselves into our cards. We want to be proud of them and we want our recipients to absolutely adore them. I used to be terrified of making mistakes. That’s why I would stare at my designs for so long before sticking them together. I was even afraid to cut up my pretty patterned papers in case I did the wrong thing and ruined them! But, the minute you apply a sketch, you can let go of all of that fear and uncertainty. All the hard decisions have already been made for you. You already know how to make your card leaving you free to just play and have fun. Creating Beautiful Cards In No Time At All! Each sketch comes with an example of how to use it. PLUS, clear and complete easy-to-follow step-by-step instructions so you can be confident in knowing that you can create each and every design with ease. As you can see, the sketch is in the top left corner of the project page for easy reference. An example of how you might use it to create a card is featured next to it to inspire you and help guide you towards creating your own design. Finally, there are comprehensive instructions giving you all the steps you need to take to create your card, including measurements in both centimetres and inches. There is also a summary of all 50 Sketches at the back so you can print them out and keep them on your card making table for easy reference (or take them to crops and card making days with friends). - Anne M. Peil, Dalby, Queensland Australia. Sketches are not dependent on having any specific supplies, using particular colours or using any special techniques. You don’t need to run out and buy the latest supplies or expensive tools in order to use them – you can adapt the sketches to suit whatever you already have and whatever techniques you like to use. Card making is about having fun and expressing your own personality while creating something special for a loved one. It’s a very personal craft and can be very rewarding. So don’t waste your time and creative energy on trying to figure out where to put each element on your cards. Let the sketches take care of that for you and enjoy yourself as you infuse your designs with your own personality through different colours, patterns, embellishments and techniques. Creation That Makes A Statement About You. Discover how to start every new card with confidence knowing exactly what to do, regardless of your level of experience. Uncover the secrets of using card making sketches to create your own masterpieces. Learn how to quickly and easily break down a sketch into its components so you can see at a glance what supplies you will need and how to put them together. Discover how a simple change in colour and embellishments creates a completely new and fresh look for any design. Easily find ideas and inspiration whenever you need it so you can create card after card without any frustrations or fear. Discover how to quickly create stunning cards that you will be proud of and your loved ones will be amazed by. Discover how to easily change and personalise a sketch to suit you. See how one sketch can be used to create eight completely different and unique card designs. Learn how to add in extra elements, rotate your card sketch design or even change its shape. See how sketches suit any theme, whether it be birthdays, Christmas, friendship, graduation or anything else you can think of, giving you the flexibility to use them for any project you want. Be able to begin right away creating precious keepsakes for your loved ones with your instant access to the complete collection. Can a simple sketch like this really make a difference to your cards? Supplies Used: Green cardstock, brown cardstock, khaki paper, Masterpiece Studios Treasured Memories paper, Scenic Route Newport White Script paper and brown ink. Supplies Used: Pink Bazzill cardstock, white cardstock, Kaisercraft Home For Christmas Santa’s Delivery paper, Kaisercraft Winter Wonderland Let It Snow paper, Kaisercraft Bohemian Threads Velvet and foam tape. Are these card maker’s any different than you? They represent women from all over the world and all walks of life who share the same passion and enthusiasm for making cards as you do. The only the difference between them and you . . . they put their doubt aside . . . and gave my homemade card ideas a try. For them my sketches and instructions are worth their weight in gold. If you too can put your doubt aside for a short time, you can see for yourself just what its like to create card after card without wanting to stop . . . and how it feels when your friends and family “oooohhhh” and “aaaahhhh” over all of your wonderful creations. Without Even Thinking About It! A lot of card makers around the world are not going to be too pleased with me for spilling the beans like this…especially after wondering why they can’t create cards like yours. This will be our little secret. Oh – and it won’t take long for you to start using these simple ideas either, especially with your instant access. And what an impact you will have on others! You’ll be amazed by the compliments and admiration you receive from the special people in your life who are lucky enough to receive one of your creations. Reserve your copy of my “50 Card Making Sketches” downloadable book right now and instead of the usual investment of $34.97 US – when you act fast and reserve one of my special offer copies YOU will save an extra $10 and get it all for just . . . $24.97! Please Note: This special may not last past the next few days. Once the special price period is over (which could be in a few days, a week or even today) I may raise your investment back to $34.97 US – which is still an absolute bargain (as over 850 of our happy customers will tell you). So please be quick, I do not want you to miss out on this special. 3 FREE Bonus gifts valued at $76, as my way of saying thank you in advance for becoming a valued customer and giving my card making sketches a go. Having the correct equipment in your card making toolbox is essential for creating stunning cards but you DON’T need all the latest gadgets and gizmos. Discover the 3 absolute must-have card making tools that I couldn’t live without and that should be in your toolbox (you’ll be surprised how simple and inexpensive they are!). Learn how to choose your cutting tools for fast, accurate and clean cutting (there’s nothing more frustrating than a cutter that won’t cut!). 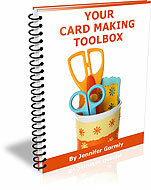 Discover 9 core tools that make a wonderful addition to your toolbox as you move forward in the world of card making. You don’t need every new tool that comes out…but a few well chosen pieces of equipment can make a real difference. Be inspired by unique and fun design ideas that you can easily incorporate into your cards for a fresh look. Discover the must-ask questions you should consider before investing in a personal die-cutting system. Learn what you need to enter the fabulous world of rubber stamping. Discover my simple secrets for creating distressed edges for that stylish shabby chic effect. Explore the different varieties of cardstocks and patterned papers available to you (have fun and be inspired by the wide range of colours, patterns and textures on offer). One of the questions I am asked time and time again is what adhesives I use to make cards. Too many adhesives are just not good enough as they don’t stay sticky. You put so much effort into creating your beautiful cards and you don’t want them falling apart! Discover the exact adhesives I use to ensure my cards stay stuck together – there’s no being sent through the mail and arriving in pieces when you use these glues! Learn how to adhere vellum without those nasty glue marks showing through. Discover how to attach ribbon without spending half your day having to stitch it down or deal with messy glues. Uncover my secret to gluing down heavy three-dimensional items so that they stay stuck and you can’t see any glue marks. Learn how to remove unwanted adhesives quickly and with no fuss (how many times have you glued something down and then moved it only to discover you are left with ugly glue marks?). Discover why I stick to photo safe scrapbooking adhesives for all my card making projects. 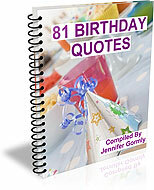 81 different birthday quotes especially chosen with you, the card maker in mind. (Did you ever spend hours pulling your hair out digging through quote directories in search of a quote only to find none of them really suited your card?). You will never have to stress about trying to find the right words for your birthday wishes again. When words escape you and you want to say more than just “Happy Birthday,” use one of these quotes to express your thoughts and feelings. They will save you time and headaches. Fun, playful quotes capture the joy and frivolity of birthday celebrations. Just the thing for light-hearted and humorous birthday greetings. Thoughtful reflections on the magic of birthdays and expressions of how you feel about your loved ones. Perfect for sentimental birthday wishes. All the hard work has already been done for you. Keep them on hand for your birthday projects and you’ll be amazed at how much time and energy you will save (and how much your loved ones will appreciate the extra thought you put into wishing them a wonderful birthday). You couldn’t buy the basic supplies you need to get started for this price – let alone the personal satisfaction and pride the many women who are using these sketches are already experiencing. Yet, for the price of a few of cups of coffee at your local Starbucks or a couple of packets of decorative brads . . . you can create jaw-dropping cards yourself. This, my card making friend, is the bargain of a lifetime for serious card makers like yourself. What’s more, your small investment is actually irrelevant, because. . .
Here’s how it works: I personally guarantee you will be 100% satisfied with your investment in 50 Card Making Sketches or I will refund 100% of your money. As soon as you get these sketches in your hands I urge you to print out the summary at the back and select a few designs you absolutely love. Grab your materials and create a few sensational cards. Take note of how fast you get the first two cards finished and looking fabulous. At the end of 60 days or anytime before if you’re not 100% convinced you can begin creating card after amazing card . . . I want you to get your money back. No questions asked. No hassle. Heck, even if you get too busy. . . or for no reason at all I will promptly refund your investment in full. No fine lines. In fact, I would be ashamed to know you are struggling through these sketches with no results and without being 100% satisfied. Could I be any more honest and upfront? You be the judge, (not me) and decide if you’re ready to start creating star quality cards your loved ones will adore. How fair is this Guarantee? Invest in your discounted copy of “Card Making Sketches” right now for instant access. *** When you place your order, you will get instant access to the full collection straight away. It doesn’t matter where you are (Australia, USA, Antarctica . . . it really doesn’t matter). There’s no waiting days for something to arrive in the post and no ridiculous shipping charges – you simply download to your computer and start making those cards! It’s Now Up To You . . . I have done everything I can do to prove to you just how inspiring, helpful and informative my 50 Card Making Sketches book will be for you. But it is up to you. If you want to continue struggling to create cards you are proud to give to your loved ones . . . then do not invest. If on the other hand, you want to create awe-inspiring handmade cards with very little effort, blowing away anyone who lays an eye on them . . . then take immediate action right now, while it’s fresh in your mind . 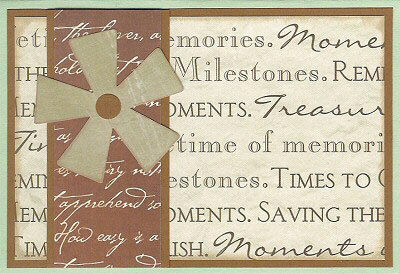 . . today and turn your handmade cards into treasured keepsakes. You have absolutely nothing to risk and everything to gain! Wishing you many years of rewarding Card Making. P.S. HURRY! This is a special price for 50 Card Making Sketches. Once the special price period is over (which could be in a few days, a week or even today) I may raise your investment back to $34.97 US . . . which is still an absolute bargain, however I do not want you to miss out on this special price OR the 3 FREE Special Card Making Bonus Gifts valued at $76. These 3 FREE Bonus Gifts may not always be available. To ensure you lock in your special, one time low investment and qualify for YOUR 3 FREE bonus gifts . . . valued at $76 -simply download right now! P.P.S. Don’t forget you have a full 60-days to evaluate every one of the 50 sketches inside this manual. You could create a lot of cards before the guarantee period is over. And when you do . . . I would love to see how they turned out! Click here to invest in 50 Card Making Sketches!